I'm a user familiar with StackOverflow websites but it took me a while to locate the Ask Question button on Ask Ubuntu. Reason: Insufficient contrast (as can be seen below). A single grey / translucent back background should fix the problem. My main point is that it seems to be more part of the side bar - then the top primary navigation. When first searching where to ask a question, people look first to the primary horizontal navigation. Notice that they have varying design aesthetics, I think we can improve visibility of the button without sacrificing the look of the site. Note that we can keep more space between the orange bar and the questions, sometimes important notes appear in that space. The positioning over the darker color automatically improves contrast. If 1 in 20 people coming to the site to get help can't see the button they have to click to get help, that would make this an extremely serious bug. You can ask a question by pressing that button. When the user hovers the mouse pointer over the notification, the Ask Question button is highlighted. While decisions about this should be made to make the site accessible to users, that would not be the only benefit. Questions posted as answers constitute a substantial commenting and flagging load on users, and the workload for moderators to deal with all these flags is probably rather formidable too. Finally, we should find out if the Ask Question button, as it is now, is specifically inaccessible to people with certain disabilities. It is critically important that we not conclude it's fine as it is, at least until we have satisfied ourselves that we're not discriminating against people with visual impairments. I like it. I think it's classy. And really, it looks like plenty of folks have been able to find it so far - only two other sites on the network have more questions asked each day, and one of those is Stack Overflow. mateo_salta's alternate designs are nice enough, but frankly, I think this is change for the sake of change. Our Ask Question button kinda fades out a bit and might be hard to find for a new user visiting the page for the first time(s). 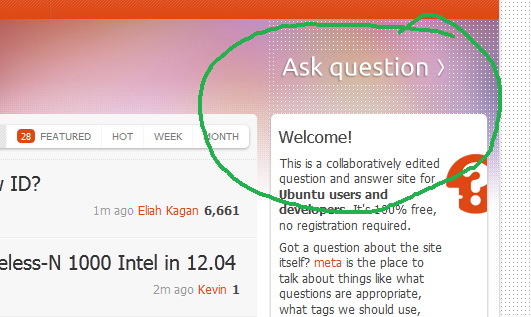 Wow, we have a nice looking Ask Question button compared with other sites, and it looks awesome in the layout! I agree that we could improve the visibility of the button, the hover effect is nice, but the button could get nicer border to make it more prominent on the main page. It is my wish that we have a look at some options, without modifying the button so much, but make it more prominent. While some people may not be able to see the button, 95% of the people out there are able to see it (supported by how many new questions we get in any given time period greater than an hour). Given this, I wouldn't find any logical reason to change the way it is now. That would take away from the design of the site. Aesthetics are important, and adding a grey or translucent background to the button takes away from the aesthetics (it looks ugly).